For war to occur, the military, arms companies and the government need to be in a position to support it. In turn, they need to have enough support from the general public to make this happen. 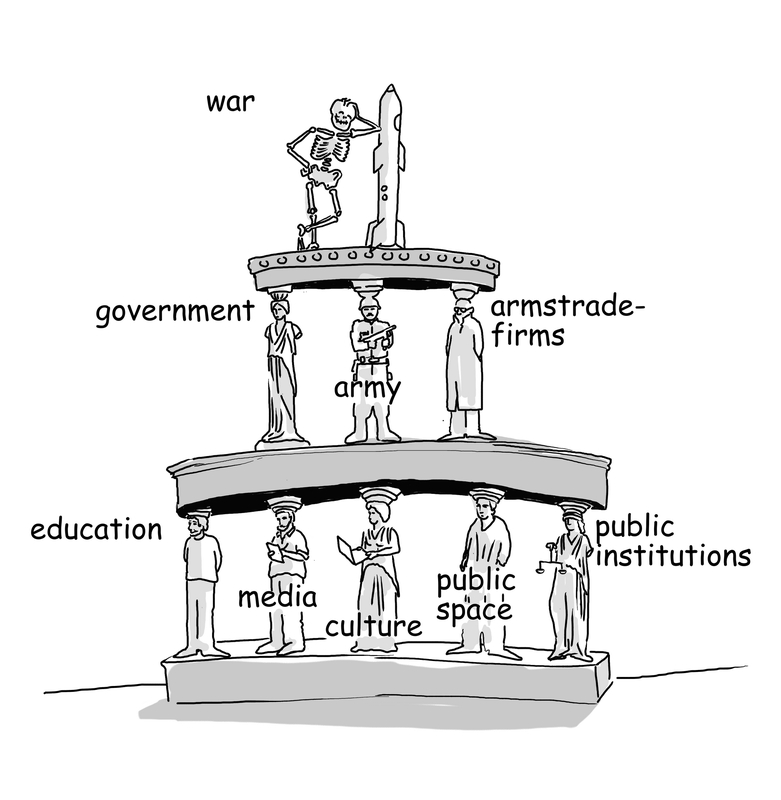 The military, arms companies and the government seek to influence society in order to make sure the public supports military action. Since Britain’s unpopular involvement in Iraq and Afghanistan, there has been a concerted effort made by the government and the armed forces to promote the military and to make sure it has enough support to go to war. 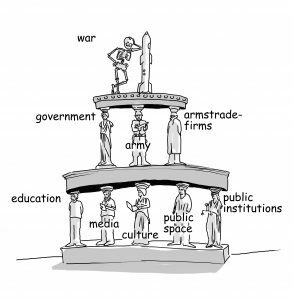 A government report on National Recognition of the Armed Forces noted in 2008 that, “public understanding of the military and recognition of their role will always determine the climate within which the Forces can recruit, and the willingness of the taxpayer to finance them adequately”. As a result the armed forces have become more visible across society: in schools, in parliament, in churches, in sport, in culture, on special occasions, during Remembrance, in the media, on public transport, and in local government and other public bodies. We are encouraged to think well of the armed forces and uncritically accept what they do. ● support for members of the armed forces and veterans is conflated with support for military institutions. Many people may assume that we have always celebrated Armed Forces Day (which was established as late as 2009), and that the military has always been involved in state education. 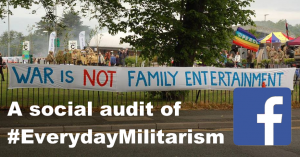 The gradual creeping militarism in our society has gone largely unnoticed or unmentioned. But people from across Britain are becoming concerned about it, and have been taking action. 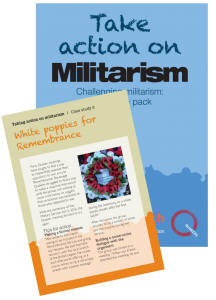 This resource will share their experiences and ideas, and share our understanding of how the military is influencing key parts of civil society.  We hope it will inspire and support you to take action on militarism. Militarisation: the action of making military in character or style; spec. transformation to military methods or status, esp. by the provision or expansion of military forces and other resources. 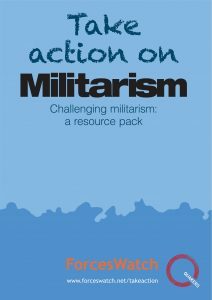 “To become militarised is to adopt militaristic values and priorities as one’s own, to see military solutions as particularly effective, to see the world as a dangerous place best approached with militaristic attitudes”.